Aaron Siegel’s inquisitive and playful work represents a personal vision of how we live with and respond to the sounds in our world. He is a composer of music for the concert stage, the theater, video, and public art. His large body of work for mallet percussion instruments has been embraced by a wide range of ensembles and is performed on a regular basis throughout the United States. 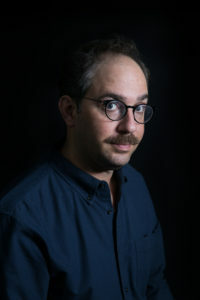 Siegel is one of the co-founders of Experiments in Opera (EiO) with whom he has produced over 60 new operatic works since its founding in 2011. In 2019, Siegel released ‘A Great Many’ on New Amsterdam Records, featuring Mantra Percussion and clarinetist Christa Van Alstine. They celebrated the release of this recording with a performance at National Sawdust in Brooklyn. In April 2019, Siegel will premiere five movements of a new oratorio I Will Tell You The Truth About This, I Will Tell You All About it, based on poems by U.S. Poet Laureate Tracy K. Smith, at the Schomburg Center in Harlem. His contributions to the collaboratively-composed opera, Chunky in Heat, will be heard at the premiere in May 2019 at The Flea Theater, produced by Experiments in Opera. Other recent work has included a performance of the opera in development, Rainbird, co-created with Mallory Catlett at Roulette in December 2017. In May 2017, his short opera The Wallet was premiered at Symphony Space as part of Experiments in Opera’s ‘Flash Operas’ program. With soprano Michele Kennedy he premiered Stay in the Sun, a song cycle based on the poems of Tess Taylor. Navajo Manner, sung by the baritone Dashon Burton received its premiere in June 2017. Highlights of the past seasons include the premiere Siegel’s evening length opera, Brother Brother, at the Abrons Arts Center in May 2014. In 2015, EiO premiered Sisyphus, a co-composed opera with Matthew Welch and Jason Cady. Siegel’s monodrama Laughing which tells the story of Abraham and Isaac through the lens of a tortured performance artist was premiered at Roulette in Brooklyn in April 2015. Young People’s Chorus of New York City commissioned Aaron to write a new work for young voices for its Radio Radiance Series. The resulting piece, The Mysteries of Nothing was premiered in April 2015 at SubCulture. In Fall 2014, Siegel released his first recording as the solo artist Call Us Your People, an hourlong meditation on death and absurdity for voice and synthesizer. Siegel’s music has been presented by the Abrons Arts Center, Young People’s Chorus of New York City, Incubator Arts Project, Roulette, The Industry’s ‘First Take,’ Music at First, Carlsbad Music Festival, Sonic Frontiers, The Chocolate Factory, Issue Project Room, River to River Festival, Le Poisson Rouge, Make Music New York, Ulrichsberg Kaleidaphon, Bowerbird, ArsNova, Wet Ink Musics and AugustArt. Other works have been performed at PASIC, the Friends Meetinghouse in Manhattan, the Corcoran Gallery of Art in Washington, DC, SUNY Purchase, and the Chashama Art Space in Times Square. Siegel’s music has been performed by Wild Up, Flux String Quartet, The Young People’s Chorus of New York City, pianist Emily Manzo, the Kyklos Ensemble, Mantra Percussion Ensemble, Till by Turning, Iktus Percussion Quartet, Beaten Path Percussion Duo, Cadillac Moon and the Aaron Siegel Ensemble. In May 2011, Siegel released Science is Only a Sometimes Friend for eight glockenspiels and organ on LockStep Records. The CD and audio download was celebrated in a release concert at Incubator Arts Project in Manhattan and praised by Sequenza 21 as an “elegantly shaped and often beguiling sound world.” NewMusicBox said of the CD that “It is one continuous ecstatic sonic event that mesmerizes, transfixes, and transports. While you are listening to it, you feel like you have been teleported through a vortex of endless doorways which keep opening but ultimately never go anywhere and that your journey will never end.” Science Only a Sometimes Friend was named one of the Best CDs of 2011 by Time Out New York. In April 2008, Siegel premiered The Swan Catchers, commissioned by the Jerome Foundation for the Flux String Quartet and 4 actors at the Chocolate Factory Theater in Long Island City. In June 2011, Make Music New York and the River to River Festival presented a performance of GROUP, a collective sound piece for public performers and an iPhone application. His work has been supported by grants from Meet the Composer, The American Composers Forum, The Jerome Foundation, the Aaron Copland Fund for Music, The American Music Center, Wesleyan University, and by the Consulate General of Argentina. He has presented his work at the Cybersonica Festival of Sound and Art in London, UK, the Art Academy in Dusseldorf, Germany and the University for Art and Design in Karlsruhe, Germany. Siegel has studied with Nora Davenport, Stephen Rush, Alvin Lucier, Ron Kuivila, Anthony Braxton and Bunita Marcus. He has an MA in composition from Wesleyan University. Aaron has shared the stage as a percussionist with Anthony Braxton, Scott Rosenberg, Jessica Pavone, Stephen Rush, Andrew Raffo Dewar, Jason Roebke, Nate Wooley, Ben Hall, Matthew Welch, Taylor Ho Bynum, Chris Peck, Sean Meehan, and others. He is a member of Memorize the Sky, The Anthony Braxton Sextet, White, Blue, Yellow and Clouds, Assembly and his own group, Where from Here. In 2006, he founded the Aaron Siegel Ensemble, a New York-based group that performs his music in concert and on recordings. As part of these and other ensembles, Aaron has toured extensively in the United States and Europe. Brooklyn-based Peacock Recordings released the first recording of the Aaron Siegel Ensemble, Every Morning, A History, which was praised by Signal to Noise as being “representative of the flowering DIY chamber music scene in Brooklyn.” Memorize the Sky has released three recordings: Memorize the Sky (2007, 482 Music), In Former Times (2008, Clean Feed Records) and Creeks (2010, brokenresearch) all of which document an ongoing improvisational collaboration with bassist Zach Wallace and reedist Matt Bauder. In 2009, Aaron recorded Our Reluctance is Overstated for six timpanist in collaboration with percussionist Joe Bergen and the online record label Shsk’h.The Cabinet, a solo percussion CD (2006, Longbox Recordings) was praised by The Wire in as “an exquisite set that has a meditative ease and grace.” He has released limited edition CDs of his electronic music including Rooms and Spaces and Sounding Place. His playing is featured on several recordings with Anthony Braxton including the mammoth 9-CD Box Set, 9 Compositions (Iridium) 2006. One of his tape pieces was selected to be part of a compilation entitled A Call for Silence that was curated by the London-based Sonic Arts Network. In 2009, Siegel released Fiddle and Drum a collaborative project with the fiddler, Sam Amidon. Aaron is on the staff of the Weill Music Institute at Carnegie Hall. He lives in Brooklyn, NY with his wife and son.